We ♥ NHS. Whilst Dr Morton's - the medical helpline© is independent and not in any way associated with the NHS, we are firm believers in the NHS service. Our UK NHS service is the envy of the world. We are very proud of it. It is successful. We want it to be yet more successful. Nothing in what we say here should in any way be read as critical of our NHS GPs. In offering services outside of the NHS that our customers pay for, we believe that we complement the NHS service and free up its resources to deal with cases of need or urgency. Local NHS doctors are private businesses. Almost all General Practitioners ('GPs') in the UK are independent partnerships or companies acting in the name of the NHS and most NHS GPs are self employed ('NHS GPs'), even if they employ salaried doctors within that partnership. NHS GPs are free to work elsewhere, within the confines of their partnership or employment contract with their surgery. Our doctors are also NHS doctors. We like them to work within the NHS with face to face contact with patients as well as work with us by phone and internet. Each GP or private doctor working in the UK is responsible for his or her own clinical decisions and consequently takes insurance cover as an individual rather than collectively through a company or partnership. We publish the GMC reference number for each of our doctors as required. NHS GPs are not paid or incentivised to see more patients. NHS GPs are remunerated largely based upon the number of patients on their list and not the number of patients that they see each day. 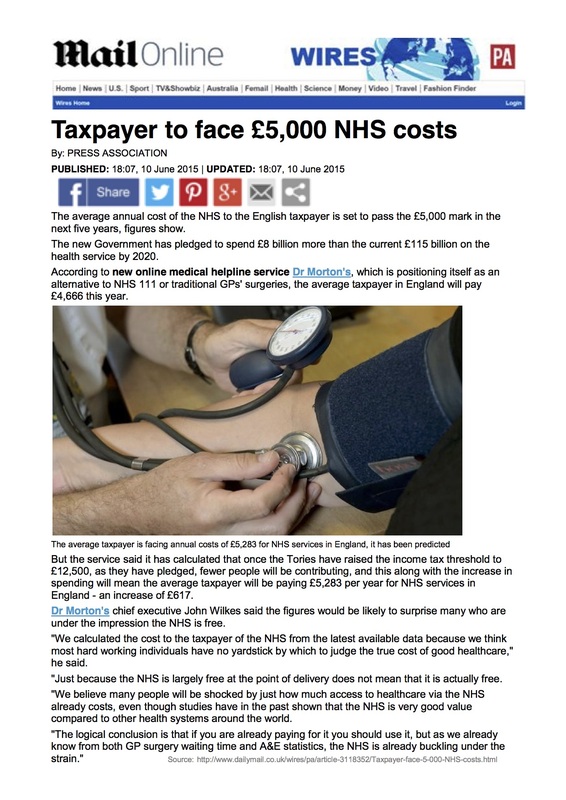 Because GPs are simply acting in the name of the NHS, the risk of 'treatment for money' is reduced, a risk which is evident in some parts of the world. NHS GPs tend to feel overburdened by what may seem like increasingly insatiable demand for services which are free at the point of delivery coupled with limitations on the resources available to provide their service. GPs work both intensive and long hours to care for the patients on their list and have a strong sense of duty to the public. NHS services are not free. The cost is £4,666 per person (1). NHS services are paid for via our taxes. We recommend that you use them. Whilst this cost has doubled in the last decade (2), it still represents very good value compared to other health systems around the world (3). NHS dental and optical are pay for services. Prescriptions in Wales, Scotland and Northern Ireland are free but those in England are not. Prescriptions in England cost £8.40 for each drug prescribed for anyone under 60, over 16 (or 19 if a student) or not on a low income or with certain exempt medical conditions. A dozen items prescribed on one prescription would therefore cost the patient £98.40 before taking account of the patients travel cost and time in collecting the prescription from the chemist. Private prescription costs are typically higher because both the doctor and chemist may charge what they like. England has never quite been able to afford a free NHS. When Aneurin Bevan, Minister of Health unveiled the NHS on 5 July 1948, it was introduced in Britain as a completely free service. This placed a huge strain on the Government's finances. Bevan resigned from the Cabinet in 1951 when Hugh Gaitskell, the Chancellor of the Exchequer, proposed a one shilling (5p) prescription charge and fees for dental treatment and glasses. These were introduced in 1952. Prescription charges were abolished in 1965, but introduced again in 1968. The cost of the NHS has grown and now represents around 35% of Britain's budget. The NHS has been successful in increasing our average life expectancy significantly. The cost of the NHS is predicted to grow further as our population ages. The NHS is successful and could not be abolished. Any suggestion to the contrary is merely scaremongering. This is because the NHS has the benefit of scale. The NHS deals with over one million patients every 36 hours (2). There is no way that a private health service could replicate this in the UK. The private sector does not have the resources. The NHS eliminates the huge administrative burden and cost of fee collection from patients and insurance companies, duplication and payments between companies present in other economies such as the US. The NHS has huge purchasing power particularly with drugs. Per capita expenditure on drugs is 2.5 times higher in the USA than in the UK. 16-17% of US GDP is spent on health care compared to half this in the UK (3). "Healthcare… is arguably the last major industry to adopt technology in its daily interaction with service users" (6). Large organisations have many great advantages but tend to be slower or more difficult to change. As Karen Taylor of the consulting and accountancy firm Deloitte says "History has shown that technology and innovations are the two main drivers of productivity". Around 60% of the NHS budget is staff cost. The largest component of Britain's £1 trillion unfunded public sector pension deficit comprises of our obligations to NHS workers. With 1.7m employees, the NHS is one of the biggest employers in the world; bigger than the Indian Railways, but smaller than Walmart or the US Department of Defence (5). "Most people now use telephones, video, mobile and web technology as an everyday method of sharing knowledge, information and expertise...The potential for technology to make home based care more effective, convenient and personalised has never been stronger" (4). We believe that the same is true of healthcare provision in the office. In summary, the NHS is a highly successful service, of which we are all proud. It clearly outperforms healthcare services in many other developed countries, despite costing much less than most of them. It is a fair and considerate service, free at the point of use, exempting those with low incomes, such as pensioners and students from paying, and is receives constant investment. It has been shown that patient satisfaction and public confidence with the NHS is higher than most countries, thanks to its continuous improvement. However, there is always more to do; particularly with adoption of available technology to benefit its patient customers. At Dr Morton's - the medical helpline © we believe that we complement the NHS, and can reduce the number of people with easily treatable problems booking physical appointments, by treating them over the internet or by phone. 2. Doubling of NHS costs which says NHS net expenditure has increased from £49.021 billion in 2001/02 to £104.333bn in 2011/12. The 2013 Budget indicated that expenditure for 2012/13 amounted to around £106.6bn (£102.9bn resources and £3.7bn capital). The cost of NHS England for 2015-16 is £115bn.